Natural organic fertilizers are the most important part of the organic program. Organic fertilizer should be applied at least in the beginning three times a year; late winter or early spring, early summer and fall. Recommended rate is about 20 lbs. per 1000 square feet. Rock powder should be applied at about 40 - 80 lbs. per 1,000 square feet. Among the best choices are zeolite, lava sand, basalt, and other volcanic materials. Granite and diatomaceous earth are also good. This is not necessary if you have volcanic soil. All soils will benefit from quality compost such as earthworm castings. Broadcast at ¼ to ½ inches across all beds and turf. 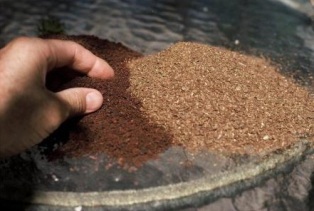 A handful of earthworm castings or soft rock phosphate added to each hole when planting bulbs or small transplants will greatly benefit plants as will misting or soaking bulbs or seeds before planting in Garrett Juice. Another advantage of the natural organic program is that fertilizers and amendments can be applied any month of the year. One of the most cost effective fertilizers of all is dry molasses. It provides minerals, stimulates biological activity and runs off fire ants. One of the many reasons that organic fertilizers save money is the reduced need for irrigation. There are all kinds of problems with synthetic, high-nitrogen salt fertilizers. Besides needing to be applied more often, they are basically salts. These salts build up and damage the soil life and plant roots. High levels of nitrogen force fast growth that results in weak watery cell growth in plants. Plants grow and flower, in the short run, but the imbalance and the watery cells that are created bring on insects and diseases. Plant health is decreased long term. Nature’s job is to take out sick plants and to encourage the survival of the fittest. Synthetic nitrogen, even if attempts have been made to artificially slow its release, is soluble and doesn’t stay put in the soil. Rain and irrigation washes it away and leaches it through the soil into the water stream. And that is after much of it has volatized into the air increasing air pollution.